Mike Wrobel, of Lakewood, N.J., said living conditions under the bridge on Kensington Avenue near Lehigh are dire. For most people in the Philadelphia area, Wednesday's storm was an inconvenience: a wet, miserable day better spent inside. But for people in treatment for opioid addiction, severe weather — or anything that keeps them from the medication they need to stave off painful withdrawal symptoms — can become a life-or-death challenge. That's why housing staffers, outreach workers, and doctors across the city scrambled on Tuesday to prepare for the storm. Making sure patients could get to methadone clinics or pick up their suboxone prescriptions was paramount as the forecast worsened. Both medications are themselves opioids, carefully administered to help a patient gradually get out of addiction. Such medication-assisted treatment, or MAT, has been found in studies to offer patients the best chance at long-term recovery. "If you can't find suboxone somehow, you risk severe withdrawal," said Lara Weinstein, a professor at Thomas Jefferson University who prescribes suboxone to patients at Project HOME's Stephen Kline Wellness Center. Some patients, in desperation, might turn to heroin to fight withdrawal symptoms, she said. "And every time you go back to heroin, you risk overdosing," especially now that it's often impossible to know if a dose of heroin contains the far more potent fentanyl. So she and her staff spent Tuesday making contingency plans, such as getting some patients to the clinic early, prescribing others an extra dose to get through Wednesday's storm, or even sending a car to bring a patient to the clinic during the storm. "We have to do whatever it takes," she said. By noon Wednesday, she said, all her patients had been accounted for. After they've been in treatment for some time, patients on suboxone can get prescriptions for larger amounts of the drug — a few days', a week's, a month's supply — that require fewer visits to treatment clinics. But methadone, a similar but heavily regulated medication, requires patients to take the dose at a clinic under supervision every day. At Kensington Hospital, which hosts the only methadone clinic in the neighborhood, clinic workers said they had to close at 11 a.m. Wednesday, but had worked for the last few days to make sure all their patients got in before then. The scramble to accommodate patients, advocates say, underscores the need for more treatment options around the city, and easier access for patients in neighborhoods like Kensington where opioid use is most concentrated. But the storm's impact is harder still on addicted people living on the streets of Kensington. 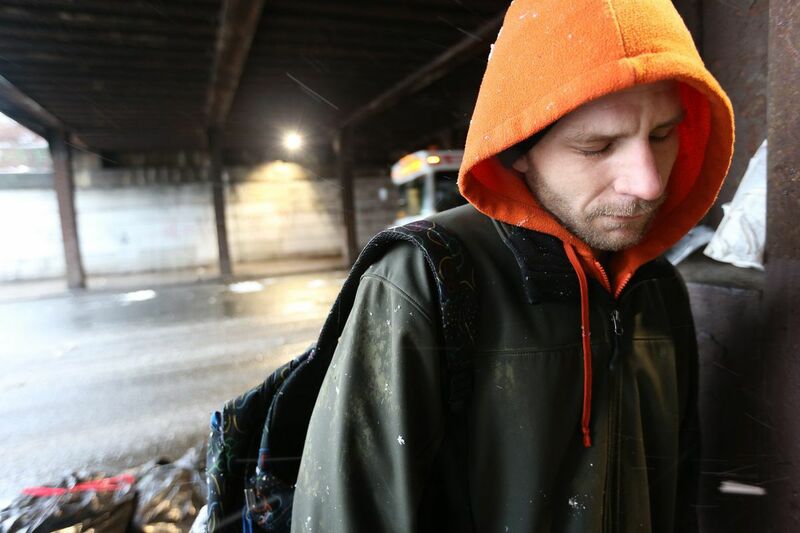 Though the city doubled its homeless outreach teams as the storm came in, many people in encampments under the Lehigh Avenue train bridges are reluctant to go to Center City shelters where they could be cut off from their drug supply and forced into immediate and dangerous withdrawal. There are only 40 shelter beds in the neighborhood itself, all usually full. The local needle exchange program, Prevention Point, is opening a respite center Wednesday night. Under the bridges, people living in the camps picked their way around deep puddles to accept care packages from outreach workers who pulled up to the curb. "Everything is so much harder" when the weather turns bad, said Mike Wrobel, 29, who spent Tuesday night on a sodden sheet at the end of the bridge. "It's harder to sleep at night. Everything gets soaking wet. Your hands are wet and cold. Your veins don't pop." Injecting heroin that morning with numb fingers, he said, he had missed a vein, potentially creating an abscess that could easily become infected. He said he and his girlfriend would be trying to seek drug treatment; the conditions under the bridge had been the last straw. Down the block, Josh, a 23-year-old who spends his nights working in a restaurant and his days under the Kensington Avenue bridge, said the weather had persuaded him, too, to seek a detox bed. "I've been out here a week or two," he said. "And I can't take it." Next to him, a woman named Julie, originally from Norristown, said she had spent the last few nights napping on a cardboard pallet inside a Christian ministry down the street. "There are a thousand abandoned places around here — houses, warehouses. If the city could just open a few up," she said, "where we could sit and have a cup of coffee."